I was inspired to make the peacock Halloween costume by a mask that I have. It was so much fun and I received a lot of compliments on it! To start, I found a blue dress that was the right color, then added gray tights. To make the tail I took a fan and used the hot glue gun to attach approximately 60 peacock feathers (which I ordered online). I used some fabric in a similar color to tie the fan around my waist. I designed it in a way to wear the tail either up or down. I covered the back of the fan with some extra fabric (to cover some of the messiness from the glue). I made a hat out of felt, glued feathers to it and attached a feather “fan” on top. You can’t see them in the photo. For the feet I took a pair of rubber gloves, pulled the thumb and pinky finger into the glove, stuffed the other three fingers with fiberfill and pulled the gloves snuggly around a pair of my ballet flats. I decided to do make-up instead of the mask after I finished making the costume; the makeup was easier to do than dealing with a mask all evening. This is a great costume! Love the feet. Hi, I’m Linsey and I’m trying to make a peacock costume for a play. I was wondering how you got the tail to go up and down without the fan falling off. Please reply, thanks. Great job! Thanks for the idea! Hi Linsey, sorry if this response is too late, I attached the feathers to a fan, the fan had a ring on it so I could use a long piece of fabric (like a scarf) to tie it around my waist. I also attached more of the same fabric to the outside spines of the fan so I could tie that around my waist to keep the tail up, and untie it to let the tail fall back (I could close the fan a little too when the tail was down). Hope this helps & was not too late. I Just love your costume I was a peacock in a musical once and I had this hat pinned on the side of my head. this may be a dumb question but what do you mean by fan? 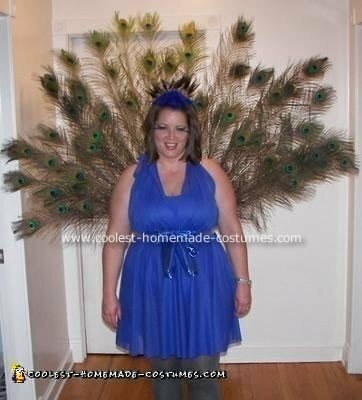 everyone who has descriptions of peacock costumes online keeps mentioning this fan. HI you are fabulous! What a fantastic idea you had for the tail.!! good for you! when I attached the feathers to the fan, I made sure I could still fold the fan so the tail “collapsed”. I also had it tied around my waist, so when I folded the fan I could kind of flip the fan so the feathers were facing down. It helped when getting through crowds and doorways. Hope this helps you. Your costume is terrific! What material was your fan made of and how large is it? I was wondering, if we paid you and paid for the cost of the materials, would you be willing to make the tail for me as well? or sell me yours? OK, I hate to ask specific comments, but my daughter and her best friend (10 year olds) are stretching the limits of my talents this Halloween with their idea to be matching peacocks for Halloween this year and I am the mom between the two of them to pull this off. So, when you say fan, can you link me to a fan that would work? And, can you give a close up picture of how you attached the belt to the fan? You may have just saved me with this!!! I love your tail but after searching for about a year, I can’t seem to find a metal fan in order to make my own. Do you have any links to a website or place that I can find the fan? I also would like to know if you could be more detailed as to how you attached the scarf/ribbon to the fan in order to wrap it around your waist? You can Google hand fans and a ton of options come up. I used a hot glue gun to attach the feathers to the fan slats. There was a ring at the bottom of the fan that I slid a long strip of fabric through and tied it like a belt around my waist – I think I also had to slip a couple more fabric strips through the end slats on the fan so the tail would stand on my back, then I would untie those to let the tail trail behind me when I didn’t want it up. Sorry I don’t have more detailed pictures of how I put it together – the tail is packed away to be used for another Halloween in the future. Hope this helps. Hi, i was wondering where you got your feathers from for it? I’ve found these ones hear on ebay, but i wasn’t sure whether 50 would be enough/ long enough? Thanks! And it looks amazing! I need this for a fitness theme wear. Would u sell this? I need it for august 24/25 please let me know email at jessicaciampini@live.com thanks!